The title and cover was enough to tempt me, as the book seemed like a humorous story on the life of a surgeon. But after reading, it was more than that. Occasionally, we can be guilty of only seeing what is happening in our own workplace and of not seeing the national or even international perspective. 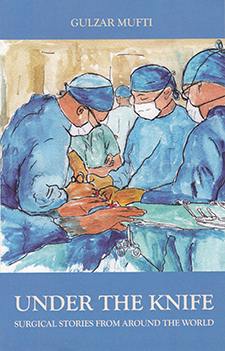 This book offers global perspectives and shows that although techniques and situations differ, universal similarities exist in theatre roles, specifically for surgeons. Clinical and non-clinical contributions from surgeons from around the world, including from the author, describe starting and continuing a life working in theatre. The patient stories highlight real situations and are at times touching and even humbling. From a nurse's perspective, particularly one who has worked in operating theatres, it would be too easy to say that this book simply offers the surgeon’s side of the story. The book recognises complex training, experience, roles, hierarchies and working patterns within the theatre team. However, there are some old fashioned views in the book, possibly to be expected when addressing historical personal recollections but I am not convinced the book needed a chapter entitled 'Female Surgeons'. Even so, it was an easy read and a book that can be dipped in and out of. Women are put off specialising in surgery because of concerns for a work-life balance.